The ASPCA reports that the average lifespan for an indoor domestic cat is now 10 to 13 years, but many dogs are living well into their late teens. Advances in veterinary medicine, nutrition and education are helping pet parents enjoy their canine companions for longer than ever before. Longer lifespans do not necessarily mean that dogs are aging more slowly; they are staying old longer. Caring for geriatric dogs presents a new set of challenges. Cognitive health is an area that affects more than half of dogs over the age of 11, but it is often overlooked as part of the normal aging process. Cognitive Dysfunction Syndrome (CDS) is a degenerative disease that affects most animals including humans, which we call dementia, senility or Alzheimer’s disease. 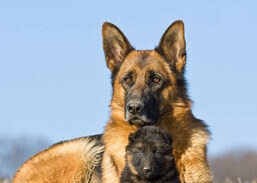 CDS is recognized by changes in a dog’s behavior. Dogs who normally recognize what time their humans come home or when dinner is served, have difficulty keeping track of their usual routine. Their sleep cycles may be off and confused dogs often will loudly whine, bark and howl during the night. As the disease progresses you may notice changes in your dogs’ personality and affection level. Some dogs stare into space, wander aimlessly or get lost in familiar surroundings. The biggest problems occur when dogs forget their house-traing and urinate or defecate in inappropriate places. Sadly house soiling is one of the leading reasons dog owners chose to have their geriatric dogs euthanized. The physical changes in the brain that cause cognitive decline are not well understood, but researchers believe changes in mental function are related to an increase in free radicals or a decrease in vascularization. Be cautious if you do notice these behavioral changes in your pet because often times similar symptoms can be caused by other conditions such as arthritis, urinary tract infections, diabetes or even cancer. It is always important to see your veterinarian if you have any concerns about your dogs’ health because your vet can examine your dog and run bloodwork to confirm that there is not an underlying problem. Some drug therapies are available for Cognitive Dysfunction Syndrome, but prevention is always the best plan. Providing your dog with a healthy diet that is rich in antioxidants and omega 3 fatty acids will help keep your pet healthy. Mentally stimulating training and lots of playtime will also help keep your dogs’ minds sharp. Dogs suffering from dementia will often feel anxious from their confusion so calming supplements or pheromones may be beneficial to help them relax. Most importantly, our senior pets need our love and compassion because they have given us a lifetime of joy. Neprilysin is poorly expressed in the prefrontal cortex of aged dogs with cognitive dysfunction syndrome. N-acetyl-D-Mannosamine treatment alleviates age-related decline in place-learning ability in dogs. PiB fails to map amyloid deposits in cerebral cortex of aged dogs with canine cognitive dysfunction. Spatial reversal learning is impaired by age in pet dogs. Modulation of cognition and behavior in aged animals: role for antioxidant and essential fatty acid-rich plant foods. A canine model of human aging and Alzheimer’s disease. Multifunctional effects of mangosteen pericarp on cognition in C57BL/6J and triple transgenic Alzheimer’s mice. DNA polymerase beta deficiency leads to neurodegeneration and exacerbates Alzheimer disease phenotypes. Dysfunctions associated with dementia and their treatment. DHA improves cognition and prevents dysfunction of entorhinal cortex neurons in 3xTg-AD mice. Serum phospholipid docosahexaenonic acid is associated with cognitive function during middle adulthood. Docosahexaenoic acid and the aging brain.